What can I say about Motörhead? Well, having witnessed them live, and meeting the immortal Lemmy, they will remain a favorite of mine eternally. 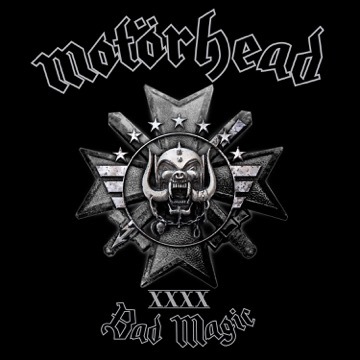 June 16th 2015 – Grammy Award winning iconic rock band Motörhead, who are embarking on a 40th anniversary world tour in support of their upcoming release Bad Magic, have announced a US tour. These North American shows start in mid-August, with Saxon and Anthrax as special guests on select dates, before ending with the now-legendary Motörboat Cruise between Sept 28th – Oct 2nd from Miami, Florida to Nassau, Bahamas. The cruise also features Slayer, Anthrax and a bumper line-up of bands including three exciting new acts, Others, Budderside, and No Words. it’s LOUD!!! SO LOUD!!! IT’S MOTORHEAD!!! This entry was posted in Artist, Bassists, Classic Metal, Classic Rock, Drummer, Guitarists, Heavy metal, Legends, Metal, Music, Outlaw Metal, Rock, Rock N' Roll, RockStar, Sleaze, Surrealist, Tattoos, Thrash Metal, Vocalist, Whiskey Metal, Words and tagged 70's, 80's, Aftershock, Anthrax, Bad Magic, Bleach Bang, Bleach Bangs, Bleach Bangs Radio, Brian May, Budderside, Cameron Webb, Charlie Owens, Classic Rock, Hard Rock, Heavy Metal, Ian "Lemmy" Kilmister, Lemmy, Lemmy Kilmister, Metal, Mikkey Dee, Motorhead, Music, No Words, Others, Phil "Wizzö" Campbell, Randy Norris, Rock, Rock N' Roll, Rock Star, RockStar, Saxon, the Hellion, the Hellion Rocks. Bookmark the permalink.